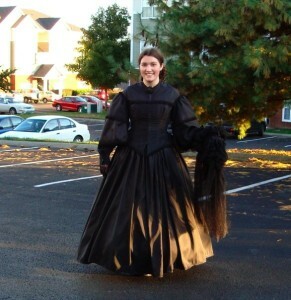 This dress was made for the “Ghostly Dinner” at the Athenaeum in Columbia, TN. It is a yearly fundraiser every October with a lovely period meal, a house tour, and a presentation of 1860’s mourning customs. 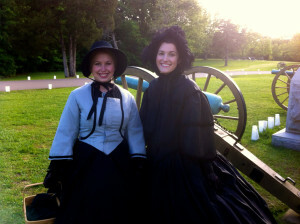 I also wore this dress to a presentation at the Shiloh Battlefield Anniversary event in 2012. 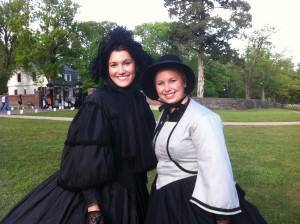 My friend, Dana Bell Wyatt, accompanied me in her half-mourning ensemble. I know I’m not supposed to smile while in “mourning” but I couldn’t help it, we had a great time.